Dementia is a progressive, life-limiting illness. People with the condition who move into a care home deserve palliative care. 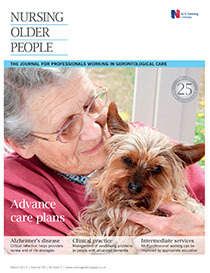 This article discusses an interprofessional pilot workshop for direct care providers held in a care home in British Columbia, Canada. The workshop aimed to incorporate a palliative approach into dementia care for residents. Workshop development, teaching strategies, evaluation and outcomes are shared. The four-hour workshop was structured to promote critical reflection and challenge participants to consider that people with dementia and their families need palliative care much earlier than during the last days of life. Commitment to change statements gathered as part of the workshop indicated that participation increased knowledge, skill and confidence to incorporate a palliative approach into care for people with advanced dementia and their families.